In what turned out to be Clark’s final season as head coach, it was also the final year for the Cougar head logo. 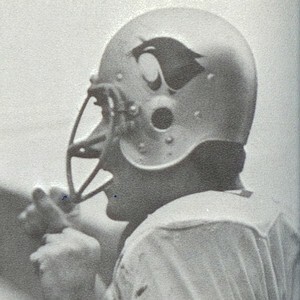 Whether it was the new technology of screening decals on clear vinyl or just a purposeful choice to change the helmet appearance, the white outline was removed around the head that had previously adorned the crimson cougar logo on each side of his team’s silver helmet. He also removed much of the squad’s enthusiasm. After harshly chastising his players following the mid-season 31-10 loss to Stanford that saw the Cougars give up thirty-one unanswered points, Clark for all intents and purposes, lost the team and the team lost its first eight games before closing with two victories. Guard Dave Middendorf was consistently excellent, earning a three year pro career with the Bengals and Jets, and Henderson while not as effective at QB remained a leader. Tackle Dave Golinsky added a four year run with the BC Lions to his resume. In Clark’s final game, Mike Cadigan who was unceremoniously shuffled from the QB position to the secondary after the opening day loss to CAL in ’66, won the rivalry game against Washington 9-7 to vindicate himself. Clark would move on to assistant positions with the University of New Mexico and with Winnipeg in the CFL before retiring.